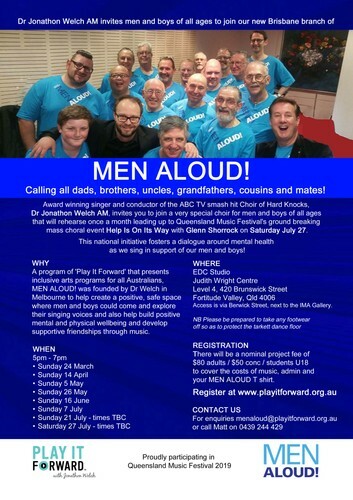 Dr Jonathon Welch AM invites men and boys of all ages to join our new Brisbane branch of Men Aloud! Calling all dads, brothers, uncles, grandfathers, cousins and mates! Award winning singer and conductor of the ABC TV smash hit Choir of Hard Knocks, Dr Jonathon Welch AM, invites you to join a very special choir for men and boys of all ages that will rehearse once a month leading up to Queensland Music Festival's ground breaking mass choral event Help Is On Its Way with Glenn Shorrock on Saturday July 27. This national initiative fosters a dialogue around mental health as we sing in support of our men and boys! A program of 'Play It Forward' that presents inclusive arts programs for all Australians, Men Aloud! was founded by Dr Welch in Melbourne to help create a positive, safe space where men and boys could come and explore their singing voices and also help build positive mental and physical well-being and develop supportive friendships through music. Students U18 to cover the costs of music, admin and your Men Aloud T shirt. NB: Please be prepared to take any footwear off so as to protect the tarkett dance floor. For enquiries, please email menaloud@playitforward.org.au or call Matt on 04 3924 4429. Proudly participating in Queensland Music Festival 2019.